Larisa Tsvetova, a talented Russian business-trainer, is engaged in her own business. She is appreciated as a highly qualified and practical worker. Her system of training was created in order to increase sales and profits of any company by 30% to 100%. Her 20 years of personal sales experience in various spheres, and 10 years experience in training make it possible to achieve the highest results. 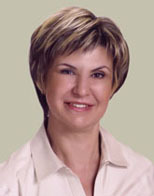 Larisa Tsvetova has been teaching sales training since 1998 in various Russian cities, including: Moscow, Samara, Ufa, Krasnoyarsk, Volgograd, Nizhny Novgorod, Yaroslavl and others. Based upon her own experience, she instructs in the sale of goods, services, ideas and international contracts. Students of Larisa Tsvetova are notable for their economic results, which can be easily estimated in rubles or dollars. Tsvetova’s School is very attractive due to its impeccable reputation and substantial results. The Tsvetova system is time-tested and proven by a number of companies. Tsvetova School offers the strategy of active, professional sales. Larisa Tsvetova is the author of educational supplies and the special educational system, "Practice of Preparation For Professionals Sellers". In 2004, the name Larisa Tsvetova was entered into the All-Russian Encyclopedia under the esteemed title of "Best People of Russia". She holds the title of High Class Professional Trainer.